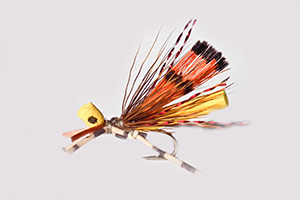 The Eds Hopper was tied and developed by South Africa’s own, legendary, Ed Herbst. He is one of the pioneers of fly fishing in this country, in our opinion, along with his good friend Tom Sutcliffe. Mr. Herbst has always been an innovator of tying “out-of-the-box” flies, and the Ed’s Hopper is an amazing foam hopper imitation that works really well, especially on small streams for wild Trout. We have always enjoyed fishing this amazing foam hopper, and so many wild Trout have been on the other end of this terrestrial. The Ed’s Hopper is proudly South African, and is one of 3 Hopper patterns that are deadly in South Africa. The other two variations being the Dave’s Hopper and the Joe’s Hopper. Ed Herbst is a fly tying genius, and despite what many people think about the appearance of the Eds Hopper, it has accounted for high numbers of not only Trout, but Yellowfish, Bass and even the smaller and more shy Cape Kurper has fallen victim to this deadly pattern.